Weeks out from Trey and Jaclyn’s engagement session at San Fransisco’s Baker Beach there was a constant watch over the weather reports and predictions for the day of the photo session. San Fransisco is of course known for unpredictable weather patterns, so hoping that the day you’ve chosen to travel to the iconic city with the Golden Gate bridge can be a gamble. Thankfully the day chosen was partly cloudy enough to allow in enough sun for their weather perfect engagement session at Baker Beach! It is perfectly reasonable to have a few nerves during your engagement session. Although Trey and Jaclyn were naturals, they were very attentive to following the directions given producing stunning engagement photos! Key tip: focus on the other person. After you have followed the directions given, don’t think about how you look (that’s the photographer’s job!) but focus on your future bride or your future husband to be. Be present at the moment, and that will reflect in your photos. I’m excited about Trey and Jaclyn’s wedding and be a part of the beginning of the next chapter and journey in marriage. 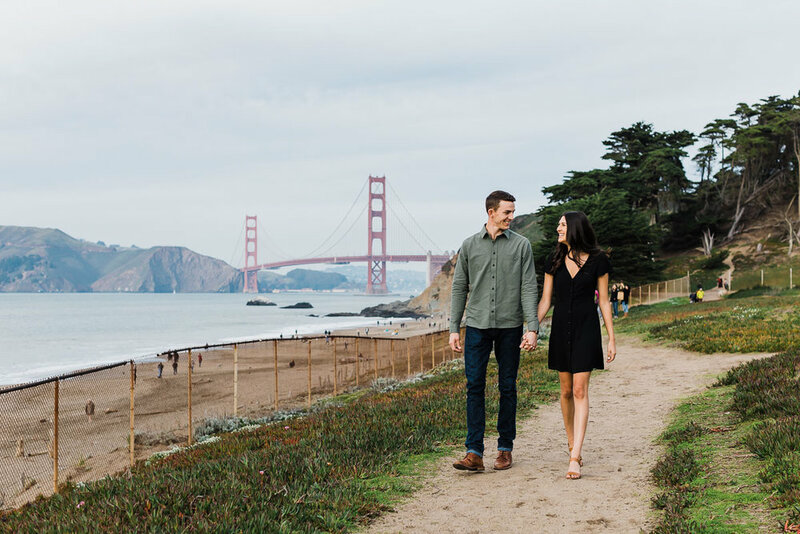 Make sure to check out more photos through the bottom button to see more of this Baker Beach Engagement Session.